An artist's concept of the Canadarm2 system - Mobile Base System, Canadarm2, and SPDM (not completed). 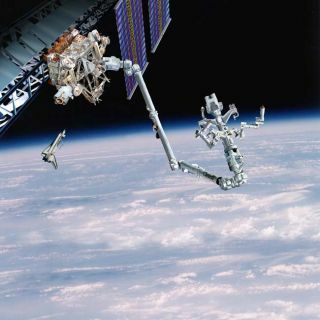 Robotic officers in Houston successfully controlled Canadarm 2, the space station's robotic arm, by remote control during a test in late February of this year. The success of the test brings about the possibility for ground-control-based assistance during EVAs. "One of the potential applications here is when both crew members are outside during EVAs ground control can move the arm to position the cameras so we can see what they're doing," said Canadian Space Agency mission controller and Robotics Officer (ROBO) Sarmad Aziz. But the real purpose for developing remote control of the Canadian built arm is to lessen the workload of the astronauts while they are aboard the station. "From the initial stages of development, what we expected to do was provide relief to the crew by taking care of mundane operations," Aziz told Space.com. Mission Control will perform simple, but time-consuming tasks such as moving payload while the station crew sleeps. While the test was successful, it was only a trial run and it will take more time to develop complex controls. In the initial run, ground controllers only gave the arm a little exercise - they waved the free end of the arm around in five-foot increments for four and a half hours over the span of two days. Members of the space station crew operate the arm in real time by hand control. From the ground, however, ROBOs must write a sequence of commands and send them in one single transmission to the station to move the arm around. "Because the possibility exists that we can lose contact with the station, we set up a chain of commands and watch it execute," Aziz explained. "That way, if we lose communication during the maneuver, [the arm] will still follow the sequence." Aziz and his fellow ROBOs spent a little less than a week designing the simple instructions used during the initial test run. They sent the instructions up over a two-day period in February and watched as the arm got some exercise. The ground control team responsible for issuing commands to the arm consists of three ROBOs at any time - one to create the commands and two more to check their accuracy and relay them to space. Currently the arm, which is nearly 58 feet long, can make its way across the station in a couple of ways. It can either ride the train-like Mobile Base System, which makes the trip along the length of the station in an hour, or it can "walk" freely like an inchworm. The arm is anatomically similar to a human arm - there's a hand at one end, an elbow in the middle, and instead of connecting to a shoulder, at the opposite end there's another hand. It can attach each hand at separate points - called Power Data Grapple Fixtures, or PDGFs - on the station. To move around, it releases the grip of one of the hands and swings that end of the arm to another PDGF on the station. By repeating this process, the station crew can maneuver the arm around the station exterior quite nimbly. Mission Control will likewise make use of the PDGF system, and there will be no limit to where they can send the arm on the station, according to Aziz. The Canadian Space Agency is currently working on building a more dexterous hand, called the Special Purpose Dexterous Manipulator, or SPDM, capable of performing more minute tasks. "The SPDM can sync up with ground control," Aziz says. Many of the exterior components of the space station were designed with a robot hand in mind, he says, and ground-control will use the SPDM to replace external batteries and manipulate other replaceable units. There is no timetable for implementation of this device.